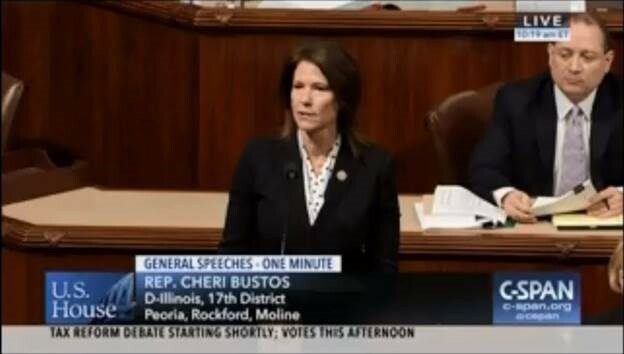 WASHINGTON, DC- Today, Congresswoman Cheri Bustos voted against Speaker Ryan’s second tax scam. With the annual deficit set to top $1 trillion this year because of their last tax scam, the non-partisan Tax Policy Center has indicated that this second GOP tax scam will add another $3.2 trillion to the deficit in the next 10 years, placing Medicare, Medicaid and Social Security on the chopping block. “Instead of working across the aisle on a comprehensive tax reform package to provide real relief to hardworking families, Washington Republicans doubled down on their agenda of raising the national debt to pay for billionaire tax breaks,” said Congresswoman Bustos. “After ushering in a new era of trillion-dollar deficits, this latest tax scam makes things even worse by putting another $3 trillion on our nation’s credit card and sticking our kids with the bill. Democrats are committed to lowering health care costs, raising wages and restoring fiscal responsibility to Congress so we can return to a government that fights for the people once again.